Note from shop owner Thank you for visiting Lavender Belle Minis. Please enter your email address there if you wish to be notified of opening times. Thank you for visiting Lavender Belle Minis. Great settee. Well done! Very Pretty!! Strolling through the cobblestone streets of London or Paris you come across a beautiful florist. You are instantly drawn to the dark moody facade and the colourful fresh flowers on display outside. As you take a peek through the double doors you see the classic black and white checkered floors and more stunning arrangements of flowers. Venturing inside you are overwhelmed with the scent of fresh blooms and stylish wares. Looking out through the french doors you can see the beautiful courtyard garden cafe inviting you to sit and sip on a barista made coffee while your flowers are prepared by the friendly staff. This is the exact scene I envisaged when I first thought about creating a miniature flower shop. Now you too can enjoy my flowers for your dollhouse, diorama or just to pop in your china cabinet as a keepsake. I'm now also adding furniture, cakes from my cakery, home decor items and many other miniatures. I loved the whole process of renovating, decorating and bringing back to life old dollhouses and wanted to keep doing them. My second and third have now also been sold and I'm working on the fourth. For me I just love the interior design aspect of this hobby and I decorate them as if it was my own big house. This led to the opening of this Etsy shop in July 2017 as demand grew for my miniatures and I was being asked over and over if I sell them. 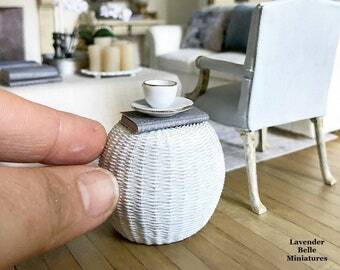 My motto is 'Miniature Touch of Elegance' and this applies to my big home and my miniatures. I adore the French, Hamptons and English and Farmhouse style of decorating and creating elegant interiors on a miniature scale. Not long after I started on this journey I dreamt of this flower shop which I would always have with me in between renovating and decorating dollhouses. The flower shop and surrounding courtyard is a work in progress and it is already expanding to become a village! I have recently added a cake shop and the flower shop also has a miniature caravan as a popup shop. I also paint little paintings for my dollhouses and I am now adding these to my store and would love to have a miniature art studio and gallery in the future. Maybe a fabric shop too, oh and imagine a beautiful little ice cream shop or hat shop.... see how my mind works!